Beaumont’s $95,000 Capital Asset Inventory: Where Is It? On April 18, 2017, Council Approved a $95,000 Contract to ‘Probar’ to Inventory Capital Assets, but the Report has Never Been Seen. The City of Beaumont has no Capital Assets listed on their Financial Statements because the City has no Capital Assets to record. The City Hall and Police Stations are old school buildings. The $300 Bond Funds acquired were embezzled. At the March, 2018, Beaumont Audit and Finance Committee Meeting Finance Director Melana Taylor informed the Board that Beaumont’s 2017 Financial Statements, which the Pun Group has been auditing since December 2017, also will not have any Capital Assets listed. Taylor claimed that the City was still inventorying its Capital Assets, but that’s not true. The address listed on Probar is Annapolis, Maryland, in keeping with Beaumont’s new tradition of hiring out of State Contractors that are located so far away from Beaumont that it’s not even remotely possible for the Contractor to do the job. 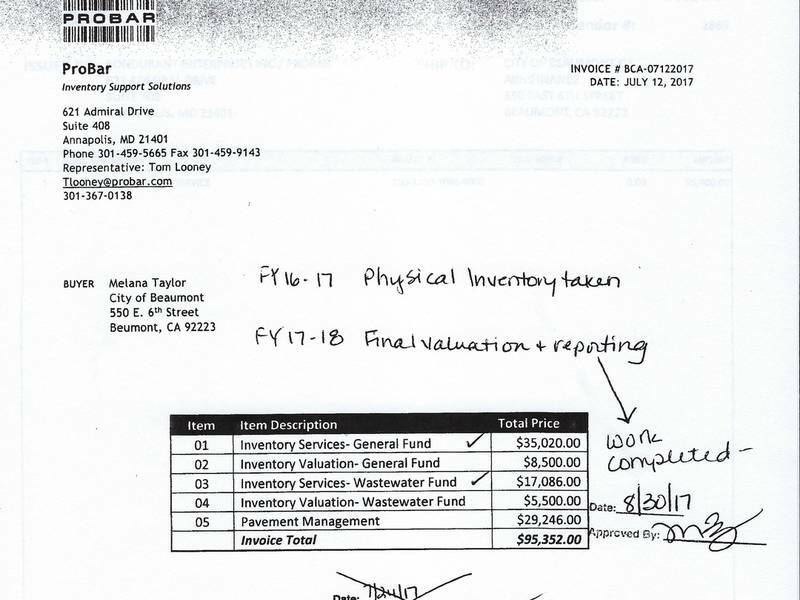 But on July 12, 2017, Probar submitted an Invoice for $95,000 for ‘General Fund, Wastewater Fund, and Pavement Management’. Melana Taylor initialed the Invoice on August 30, 2017 with a memo ‘work complete’. A Public Records’ Request will be submitted for the Capital Asset Report generated by Probar. The Report was never presented to the Audit and Finance Committee or the City Council and I’m guessing never released to the Pun Group.